There are few things that scream “summer” more than ice cream. Served up in a cone, a cup, (or my personal favorite, as a milkshake), there’s nothing better than a cool, creamy treat as the crazy heat of summer rolls on. 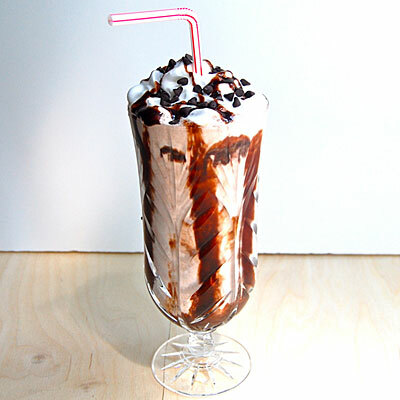 However, not only dairy-consumers should be able to revel in this seasonal ritual, which is why I reworked this Triple Chocolate Slush recipe to make it completely dairy-free. This recipe could not have turned out any better. It was a welcome treat to my non-dairy family members and even passed the test with those self-declared “dairy-only” drinkers! The soy vanilla ice cream was a perfect imitation of the real thing allowing the drink to keep all of it’s flavor and thickness without losing an ounce of taste. Additionally, the omission of the extra sugar went completely unnoticed—an added bonus for those watching their waistlines!